Description of "Making SIAM Work"
Today IT services are being provisioned through infrastructure that is located within the organizations premises or 3rd party premises. Many IT organizations are also adopting various cloud based delivery models as well. Businesses utilize the IT services for delivering the business services, as business enabler, for business communications, etc. Thus, their reliance on IT and newer technologies is increasing every day. With the advent of outsourcing the IT service delivery is itself dependent on service providers. A study suggests that on average every organization has outsourced to at least 3-5 IT service providers irrespective of the business domain. With multi-sourcing organizations tend to become a hotpot of the various practices from vendors. While at micro level the management lies with the vendors and they can do it well, the overall consolidation of services remains a challenge for the businesses. Since delivery of Services are fragmented in a multi-vendor environment with different service components being sourced from separate vendors, there are grey areas in context of ownership of overall service delivery. Multi-sourced environments rely heavily on the core management competency of the business to deliver seamless services. Also, every organization has certain tools & processes which are unique to them and so is true for the vendor organizations. Thus, complexity of integration of multiple tools, processes and people besides the overall governance in a multi-vendor environment present a perplexing view of services that easily gives up on efficiency and effectiveness. Service Integration And Management (SIAM) aims at strengthening this core and provides the directions to the suppliers and vendors to deliver defined outcomes. This drives effectiveness and efficiency of the services as expected by the business, but not as projected by the supplier. SIAM provides a structure to how the various suppliers interact and support each other. The dependencies between the services (by different vendors) are identified and SLA’s are designed to support the overarching services. The vendors get plugged into a structure (SIAM) that pushes suppliers to bring the best forward while appreciating the goods from other suppliers. Another challenge that organizations face is service and vendor consolidation during mergers & acquisitions or deconsolidation during demergers and spin-offs. Thus, questions that every CxO possibly have are: • How can all the above challenges be simplified? • How can the impact of vendor change on their organization be minimized? • How can the effect and impact of mergers & acquisitions or spin-offs on service and vendor consolidation neutralized? The answer is a highly flexible integration model which ensures that service management becomes a strategic asset for the organization. A scalable SIAM keeps its options open to accept or reject vendors based on their performance, while giving adequate level of feedback to improve. It brings an ease of plugging or de-plugging a vendor whenever the need be without impacting the business service delivery. Besides it also simplifies the process of service consolidation and deconsolidation at the business or strategic layer. This model is in line with the Service Management And Integration (SIAM). This book provides explanation about the concepts of SIAM using a mechanical fluid-pump analogy. It provides a model which would effectively and successfully make SIAM work for your business, providing a clear step-by-step solution for adopting and implementing SIAM. It highlights the prerequisites and outputs that would enable organizations to use SIAM in achieving desired outcomes. 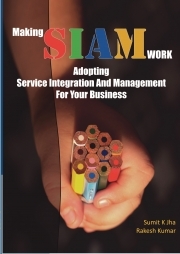 Making SIAM Work is the first ever practical book on SIAM. It is written for CxOs, Business Owners and Service Management professionals. Sumit is an IT strategy and transformation expert. He is a thought leader with extensive subject matter expertise in service management and process consulting. He has enabled his clients to define the strategic direction for service management in their organizations and refine their IT strategy roadmap. He has been instrumental in setting-up/managing Service Management practice/CoE for multiple organizations. He has conceptualized ITSM offerings and formulated go-to-market strategy for leading IT Services Companies. He has authored a book titled ‘Tackling Roadblocks During IT Implementation’ and an e-book titled ‘ITIL® & Cloud Computing’. He has authored several whitepapers and writes a blog – www.process-consultant.blogspot.com. Rakesh is a transition and transformation professional with wide experience in both technical and functional aspects of Service management. He has used his technical experience in building and delivering innovative and practical service management solutions for the customers. He has helped organizations in setting up niche service management processes, while ensuring enhanced value creation through ITSM processes and tools. He has also deployed and headed service management office for numerous customers globally. Hands On DATABASE 2000 MCQ by Harry Chaudhary. Reviews of "Making SIAM Work"